When I checked the outside thermometer yesterday morning at around 5:30, it read 38°F (3°C): not quite freezing but cold enough, I verified a few hours later in Great Hills Park, for frostweed (Verbesina virginica) to have done its ice trick overnight. Only a few plants were involved, and the formations fell short of the best and biggest ones I’ve seen, but at least we finally had a bit of icy delicacy in what has so far been a winter without a winter. If you’re new to this phenomenon, the next paragraph is a version of the explanation I gave in previous years. The name frostweed comes from one of the strangest phenomena in botany. By the time the first freeze settles in overnight on the lands where this species grows, almost all of these plants have gone to seed. Although each stalk stands there dried out and unappealing, that first frigid touch can cause it to draw underground water up into its base. 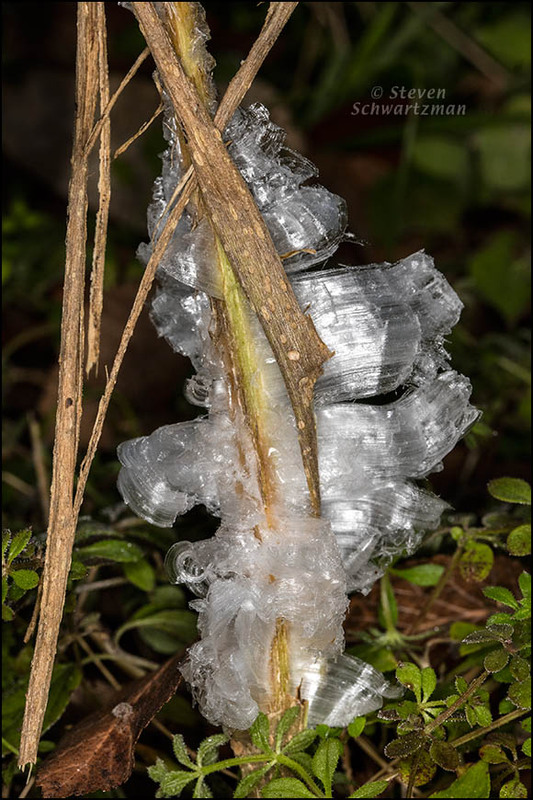 Now for the bizarre part: the section of the stalk immediately above the ground splits open as it extrudes freezing water laterally, and the process produces fragile sheets of ice that curl and fold around the broken stalk or even unscroll away from it. Las imágenes son maravillosas, Steve, el detalle que aportas en la segunda foto es impresionante y bellísima. Gracias por ellas y por tu excelente explicación sobre la formación del hielo en la planta. Aunque la primera foto demuestra bien el fenómeno, decidí añadir la segunda porque revela mejor los detalles y es una imagen más artística. Well put (and it always makes me happy to find people who use literally literally). And this time it was cool without being so cold. And I didn’t have to travel the world to see it, but just go half a mile from home. I love seeing this stuff! I look forward to it each winter but this year I was beginning to doubt I’d see it. This is just the neatest thing. I think it is poetic that you have a plant that gives you just a taste of winter. And just a taste is just enough for someone who doesn’t do well in the cold. The forecast for this afternoon is 60°. It remains to be seen whether we’ll get another chance this winter for frostweed ice or, less probably, ice on a creek, which is rare here. I won’t even bother telling you what it is doing here. I’m busy on realtor.com, praying for a property I can afford! Good luck on fording Afforability Creek. Maybe the headlines about the scary subduction zone will lower prices. For your sake, I hope subduction will work a kind of seduction on the real estate market. Yes. And now it seems I’ll have to abduct my daughter. She went to a concert in Chicago last night and now doesn’t want to ever leave! If you abduct your daughter she’ll be abject and object to moving. You are quite right about that. I am trying to wrap my mind around the concept of choosing to buy a house here instead. Maybe that suits me. You have to look harder for beauty here, but there is much to see when you put your mind to it. For the most part Austin isn’t a great scenic place, yet look at all the bits of nature I’ve kept finding here. As you say, “there is much to see when you put your mind to it.” At the same time, I understand that you’d rather be where you’d rather be, and probably nothing will ever change that. Probably true but I’m coming around. There is a cute little cottage near a non-motorized lake that I’m talking with a realtor about. It just might work, then I can begin working on my dream of a gallery nestled in a garden for people to visit and enjoy. My daughter pointed out that we could simply not be open in the winter months, and hibernate with our books. Hmmm. I like how the girl thinks! Definitely something to muse on. You’re welcome. The winter has been so mild I was wondering if I’d get to see frostweed ice this season. If not, I’d probably eventually have pulled out an unshown picture or two from earlier years (as you might imagine, there are many) to make a post anyhow. You may not have frostweed but in Vermont you get real ice and snow to play with photographically. I remember this from last year and sent your photos to plant-loving friends in the South. None had seen this. You are very observant and I thank you for letting us see the phenomena again. Just amazing. You’re welcome. Now I know what to expect and when to expect it, but I lived in Austin for a couple of decades before I ever heard about the frostweed ice phenomenon, and even then it took some more years before I finally experienced it, so I’m afraid I wasn’t all that observant initially. Amazing. I learned something new. This is a worthy thing to learn about. Happy new. Fantastic pictures. And thanks for the enlightening information. I didn’t know about that phenomenon. Here, btw, we do have freezing nights. But during the day it’s usually fine. Perhaps you can get a native plant person to point out some frostweed plants in your area so you can check them out on the morning after a freeze. Even though you’ve had some freezes already, the phenomenon may still occur on plants not already affected previously. If it’s already too late, you can plan to keep watch over some frostweed plants after the first freezes late this year. I was talking to my Kerrville friend last night, and asked if she’d seen frostweed yet. She had — about a week ago. Houston recorded its first freeze at Intercontinental yesterday morning, and I wondered if you’d found some of these delights. I’m so glad you did. Even though you say these weren’t your biggest or best, the photos are interesting because of a clarity not always seen in frostweed photos. The extrusions often tend to be more opaque: more frosty, if you will. But these show an ice-like clarity that I really like.. Clarity, thy name is Steven—except when I’m busy doing selective focus or otherwise contending with low light. (I’m only half-joking when I say that the clarity I cultivated as a math teacher has carried over into my nature photography.) Because the textures and tiny striations in frostweed ice are its most intriguing features, at least for me, I try to include as much detail as I can. The originals are much larger and therefore show even more detail than these reduced-for-the-Internet versions. 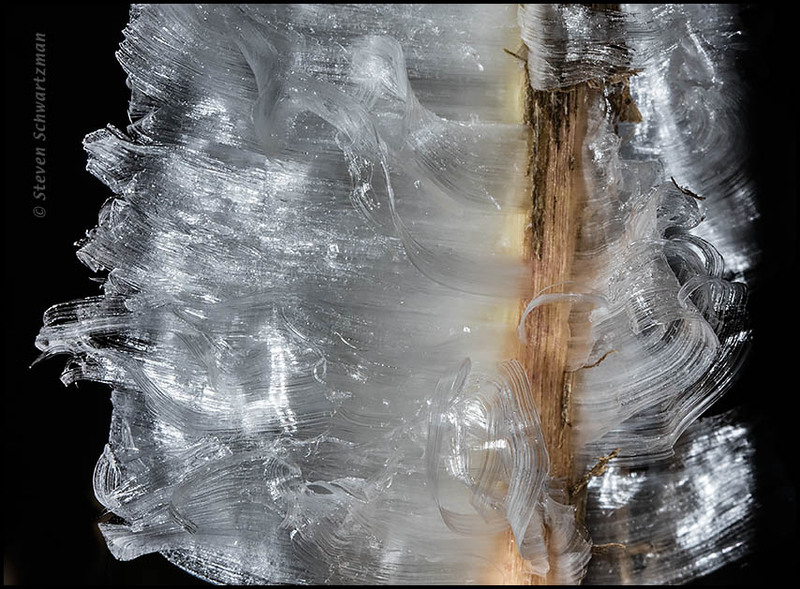 It take a macro lens to do justice to frostweed ice. Green with envy. I have yet to see this. The spot I visit in spring for these gets mowed. I’m sorry but not at all surprised to hear about the mowing. Something there is that doesn’t love a wildflower. I remember that your frostweed is quite a different plant, Helianthemum canadense, with yellow flowers, as opposed to the white flowers of Verbesina virginica. With whatever species, I do hope you get to see the ice trick someday. This is just beautiful Steve – amazing what nature can create. Little pieces of art! I like the way you put that, Inger: little pieces of art. It’s quite ephemeral art, at that. what a fascinating phenomenon. i have never noticed this, so this is something i will be watching for on frosty mornings. the weather has been quite mild this winter, with only a few days of frost so far, but this is good to know. thanks for sharing. Central Texas has had a mild winter as well, so much so that I’d wondered whether I’d get to see frostweed ice this season. I don’t know if the phenomenon occurs where you live; the first step would be to find out whether Verbesina virginica grows in your area. If so, you can keep an eye on some frostweed plants and check them out on the morning after your first freeze of the year. That is fascinating, I have never seen anything like that, thanks for the photos. There are plenty of frostweed plants in Austin and therefore plenty of opportunities to see this phenomenon, yet few people know about it. Welcome to the wonder. The frostweed’s ice trick is one of my favorites. Even though this might be a smaller showing, you’ve made the most of it, particularly with that close–up. The first picture was just for documentation. I agree with you that the close-up was artsier, and that’s why I added it to the post. It’s good to have both, so we have the context. Right. I don’t often do that, so I decided to do it here so people could see the pieces of the split stalk. I’ve never seen a phenomenon like this before!!!!!! Even in places where frostweed is common, like Austin, most people are unaware of this phenomenon. Welcome to the world of strange. Given the choice of just one season, you’re likely to get the most out of your time in the spring because of the fields of wildflowers. Probably on average late April or early May would be the best, even though by then it’s already hot here. It got down to freezing this morning so I went out for another round of frostweed ice pictures. As you say, it’s not something you’ll encounter in sunny Queensland, and even here most people don’t know about it.